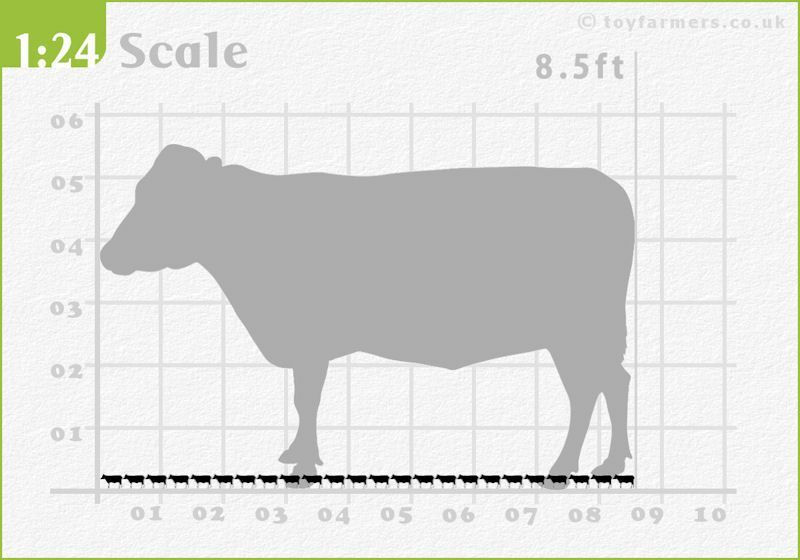 What Scale Are Schleich Animals? Well Schleich have never made public what scale are their animals are, the calculations have actually been made by toy producers so they can build there own toys centred around the Schleich range. And the conclusion is Schleich farm animals are 1:24 scale. Just so you know, the number 1 represents the real life animal, or any object, pet or person around you, well the number 24 represents the scale. How you format it doesn't really matter; for example 1 24, 1/24 or the more frequently used 1:24 - just as long as the 1 comes first. So how did they find out? Pay real attention and we'll try to explain best we can - a long with a diagram. Simply put, if you take the average length of an animal at 8.5ft (eight and half feet), then divide this by 24 (as in 1:24), the result is 0.3541666 feet - or about 3.54 inches. Then if you take this sum and reverse it, you'll end up back to a 8.5ft animal again. But bare in mind, it's all about scale so it must be accurate, with that in mind, it's possible toy producers would convert the length of the animal from 8.5ft into millimeters or centimeters for an accurate reading. Collection of Schleich farm animals; donkey foal, cow, chicken and sheep standing against a grid graphic background. Schleich have a whole range of animal toys in their collection, with their Farm World, Horse Club, Dinosaurs and Wild Life figures. And well a few of these collections, one or two are difficult to set to scale as they are made in all sizes, ruling out made to scale. We can say for certain Schleich farm animals are 1:24 scale across the whole range, and will fit in with one another with ease. What Scale Are Schleich Horses? 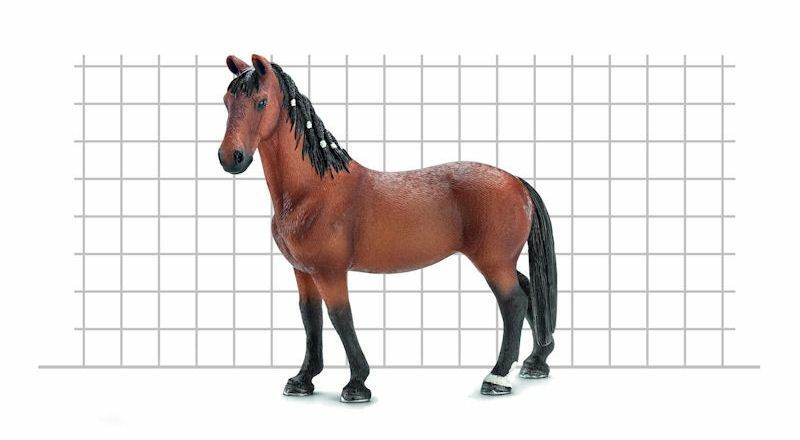 Real Schleich horse standing in front of a grid graphic. Once again, Schleich have never announced the official scale of their Horse Club range, and well they may have their reasons for not giving it away, but then they may never produced the model on a set scale. So instead it's taken a few geniuses to work it out for themselves. But it didn't start with working out what scale are Schleich horses mind you, but what scale are Schleich farm animals, due to demand range required for building associated buildings and accessories at the time were. So what is 1:24 scale? The large grey cow silhouette represents a real life cow, well the small black cows illustrate 24 Schleich cows lined up nose to tip of the tail. This is easier to work out then you'd expect, simply take the average measurement of any horse/farm animal, and divide that by 24 - the number 1 represents the real thing - well the 24 represents the scale you've divided it by. So for example if you divide it by just 9, it would be 1:9th scale, or divide it by 32, then it will be 1:32nd scale. So to clarify, what scale are Schleich horses, the answer is 1:24th scale. There sure is, just look to Bullyland, Collecta or Papo farm animals and horses for figures in the same scale - or size - to Schleich animals. Well they may measure up slightly differently, they do all measure up close to 1:24 scale. 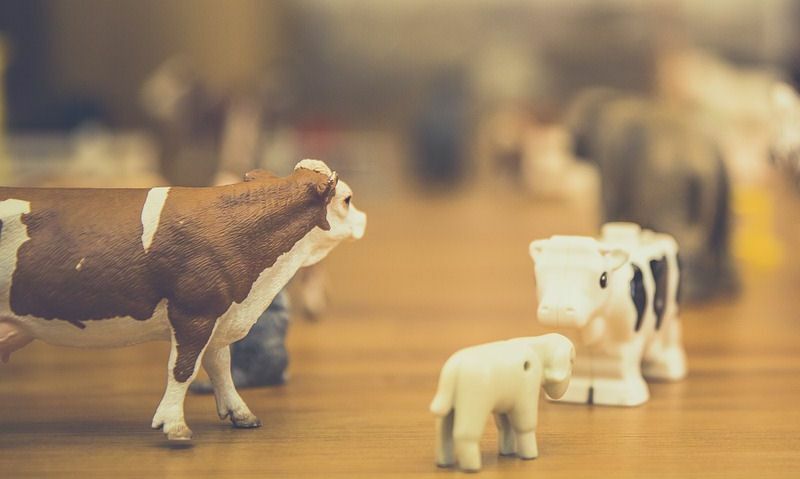 Well Schleich set the standard, it makes sense to develop your big toy horse and farm animal range with the growing trend and popularity at the time. And it's simple as that, take any object in your house, take the length or width in millimeters and devide that on a calculator by 24, and that would be the accurate scale of that said item if it was turn into 1:24 scale. That is only by volume mind, if you divide it by 24 well maintaining the ratio - length, width and height, then it would be an accurate 1:24 scale.